But a lot has changed in the last 30 years. The opportunities and lifestyle that makes up of an American Dream is available in every corner of the world now. Matter of fact, at present the emerging markets have more opportunities than the developed world. If you’re determined to be successful, you can really do well in the corporate world, hence goes the title of this post: Cashing in on the Corporate Dream. With a professional degree, if you enter the workforce at the age of 20-22; a fast paced career of 10-15 years can provide you enough savings to retire, provided you invest your savings wisely. I agree the corporate landscape is challenging these days but it is very dynamic as well i.e. offering plenty of options to make it big in short time. Such rewarding opportunities are also there if you want to be an entrepreneur instead. But I feel the Corporate World is a safer route and a sure shot approach. Being in India, I love the energy of Youth here and I notice the same in other parts of the world as well. Last year, I met a gentleman in Malaysia who told me that the young generation hardly sleeps 🙂 these days. In coming decades, I can see millions of young professionals serving as an adrenaline shot for these economies. So why not make the most of this opportunity? Coming back to the book again, the readers might find some of the concepts dated e.g. Paul suggests to invest in corporate bonds yielding 8% or more, that’s not true anymore. 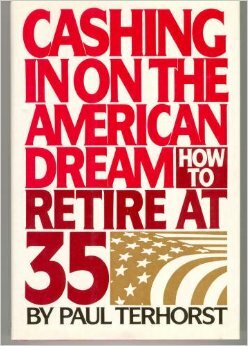 But the main idea of the book still holds true and will be an inspiring read that offers insight into many angles of an early retirement. Another interesting point to note: Paul estimated the annual living expenses (in a country like Thailand) to be $20-25K in 1985 and he is confident that you can still live (approx. 30 years down the road) on the same amt. A typical reaction would be: WHAT? What about the inflation of three decades? But I’m with Paul on that. The secret is that you live like a local, not like an expat. More time you spend doing this, you get comfortable and better at it. Eventually it becomes natural and doesn’t require much effort. Paul and Vickie sold their house and cars when retired at 35. They never had any kids either. But you don’t need to exactly do that, instead just take some key ideas from the book and fit it into your situation. Once you move to a cheaper country, you can still own a house, cars and comfortably raise kids like I do 🙂 . You just have to make sure that your investments are giving you an above average return or you have an income from something that you love doing; it can be a part-time business or a job. I don’t know whether American Dream still holds true or not but Corporate Dream does for sure. And the beauty is that anyone can access it. This entry was posted in Career, Get Rich and tagged Career, financial freedom, Investments, Living Overseas, Money, personal finance, retirement, Success on January 26, 2014 by admin.